One of my New Year’s resolutions (for both 2009 and 2010) was to learn more about Indian cuisine. 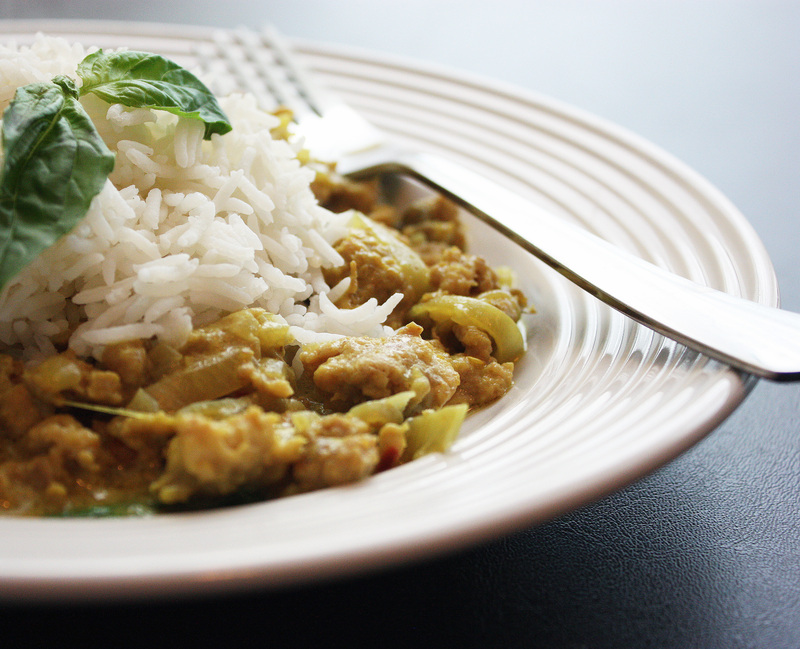 Of course, that is a lofty goal – there are nearly as many variations on Indian cuisine as there are people in India! But in an effort to start somewhere, I looked to Monica Bhide. A while back, I ordered a copy of her book, Modern Spice. I immediately fell in love with the book. Monica shares stories surrounding many of her dishes – stories ranging from her childhood to enjoyable times with family and friends. And the recipes? Astounding. No old-fashioned Indian fare here. Instead, she shares recipes for various cocktails (Guava Bellini, anyone?) and a snack I absolutely must try: Cilantro-Lemon Corn Pops (popcorn spiced with onion, lemon, peanuts, and chile powder), not to mention so many other amazing recipes that it took me a while to decide which to try first. I finally settled on a simple, speedy chicken dish. Red Chile, Garlic, and Basil Chicken was a quick stir-fry that boasted some clean, bold, bright flavors. I opted to make it a curry by adding a bit of coconut milk. This dish is by no means extravagant. As you can see, it doesn’t take a long list of hard-to-find ingredients. The red chiles I used were dried red chiles I found at an Asian market, but if you don’t have those available, you could use about a 1/2 teaspoon of crushed red chile pepper. The flavors of this dish were so deep, cheery and comforting, however, that it tasted as though it had to be difficult to make. (Those are my favorite kinds of meals!) I loved it, and I can’t wait to make something else from Monica’s book! In a large lidded skillet, heat the oil over medium heat. Add the shallots and garlic and cook for 3-4 minutes until the garlic begins to change color. Add the chiles, turmeric, and salt. Saute for 1 minute. Add the chicken and saute for about 5 minutes. Then add the coconut milk, cover, and cook for about 15-20 minutes, until chicken is done. Check for seasoning and adjust as necessary. Add the basil leaves and stir in. Remove from heat and serve hot. Serve with steamed basmati rice. Some up-front honesty before we get started: I debated whether to post this. Not because it wasn’t delicious – it most certainly was. No doubt about that. I just felt that the photo doesn’t do the dish justice. This is a dish that is bursting with flavor, demanded that I take seconds, and was indeed greater than the sum of its parts. In my opinion, this photo just didn’t convey those attributes enough. Unfortunately, it was also so well-enjoyed that by the time I downloaded the photos from my camera and came upon this realization, the opportunity to retake the pictures was long gone. All that remained were a few stray rice grains in the pan. Has this ever happened to you? After some serious consideration, I decided to go forward with it. After all, why should I make you wait until next time (and there will be a next time!)? You should be able to enjoy a dish like this today. I’m a firm believer in immediate gratification when it comes to food. The inspiration for this recipe came from the latest edition of Food and Wine magazine, amid other healthy, delicious recipes. (Yes, Food and Wine published a lot of healthy recipes this month! I was pretty darned excited, if I do say so.) 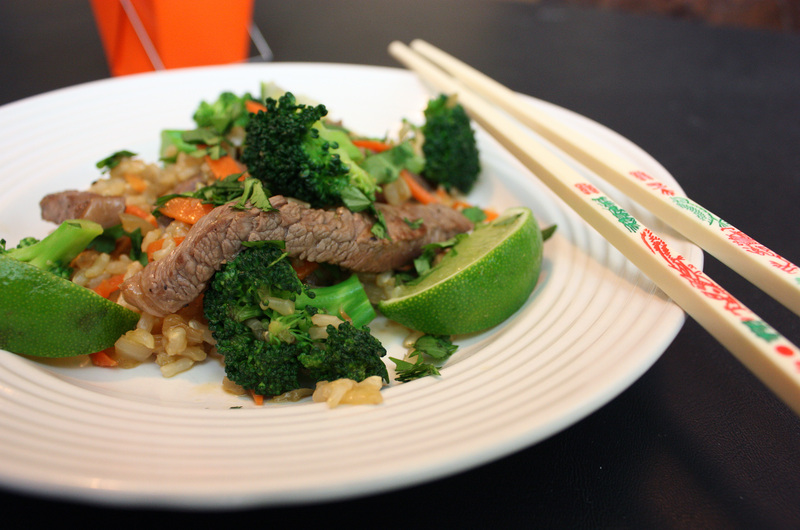 Su-Mei Yu was the creator of a delectable Stir-Fried Red Rice with Sliced Sirloin Steak and Peas dish. Unfortunately, I didn’t have red rice on hand, and I knew it would require a bit of searching to locate. While I fully intend on tracking down some red rice, just to try it out, I wanted to make this dish now. (You know, that while immediate gratification thing.) So I substituted short-grain brown rice, changed up the vegetables a bit, and basically took a large number of liberties to suit my needs. Not sure that in the end, I’m actually following the original recipe at all, but regardless, I was definitely inspired. The verdict? As you saw in the first paragraph, this was a hit. Who says healthy has to be bland or boring? I loved the slight heat the chile oil gave, loved the brightness of the cilantro and lime, and practically licked my plate clean. Even the husband was pleasantly surprised. (He’s not much for Asian cuisine, especially when it comes to a bunch of vegetables stir-fried together.) This recipe will definitely appear on the Tasty Eats menu again in the future. Fill a medium saucepan with enough water to cover the broccoli, and bring to a boil. Prepare a bowl with ice water and set aside. When water is boiling, add broccoli and submerge. Boil for 1 minute and drain, and quickly dunk broccoli into ice water to stop cooking. When cool, drain broccoli and set aside. In a skillet or wok, heat 1 tablespoon of the oil at medium-high heat until shimmering. Add the steak strips, season with a bit of salt and pepper, and spread out into a single layer. Brown for about 1 minute. Remove and set aside. Add the remaining tablespoon of oil to the skillet. Add the onion and sauté for about 3-4 minutes or until beginning to soften. Add the garlic, ginger, and carrots and sauté for another minute or two. Add the broccoli, peas, and rice and stir. Let sit untouched for about a minute, until you hear everything sizzle. Add the soy sauce and fish sauce and stir. Add the steak, sesame oil, and chile oil and stir again. Remove from heat and serve garnished with cilantro and lime wedges. I have a confession to make. It might come as a surprise to some of you. After all, there are many flashier, sexier, and more impressive foods out there in the world. I really do. Many times, I forget that I love it, casting it aside for more colorful, fancier, more elegant vegetables. But when cabbage and I reunite, it’s like reconnecting with a long lost friend. There’s no small talk. There’s no false airs, and there’s no subtext. It’s just cabbage and me. And besides. Cabbage goes great with butter. How could you go wrong? Of course, today’s recipe does not use butter. (I know what you’re thinking – Why are you teasing me? You mention butter, and now you’re withholding?) Honestly, you won’t miss it. This vegetarian (vegan if you omit the cheese) soup packs such flavor, such comfort, that it needs no buttery adornment. I love the somewhat-generous helping of Parmesan on top, but that’s it. This soup is happy just being its simple self, filling my belly. Want to know another secret? Okay, this one’s not such a secret. This soup is cheap. Really cheap. Cabbage usually sells for 50 cents a pound (sometimes 33 cents a pound!) at the grocery. A bit more if you go organic, but still…it’s one of the cheapest vegetables out there. Same goes for potatoes, carrots, and onions. I opted for a can of white beans out of convenience, but if you really want to be economical, buy dried. I used homemade stock, so it was essentially “free”, but stock (or buillion) can be purchased for little. Even with premium Parmesan, this whole meal can be made for under $5. (It cost about $3 for me.) Take that, KFC Family Meal Challenge! Now, to the giveaway! I am excited about this giveaway, honestly. The Where Delicious Meets Nutritious cookbook is a treat. I already use agave nectar in some recipes, but I was excited to learn more. I love to bake, and have been wanting to learn to bake using agave. The Xagave nectar is really great for baking – and this book pointed me in the right direction (with their delectable recipes!). I can’t wait to continue baking from it – and I hope the winner enjoys it as much as I have. And the winner is… Kristen of Flexy Fare! If that’s you, please contact me with your mailing info. Congratulations! Place a large, heavy stockpot over medium heat. Add the olive oil and swirl around to heat. Once oil is shimmering, add potatoes. Cover and cook until they are a bit tender, and starting to brown a bit, about 5 minutes, stirring a few times during cooking. Stir in the onions and carrots and cook for another minute, and add in the garlic. Cook for an additional minute, and add the stock and the beans. 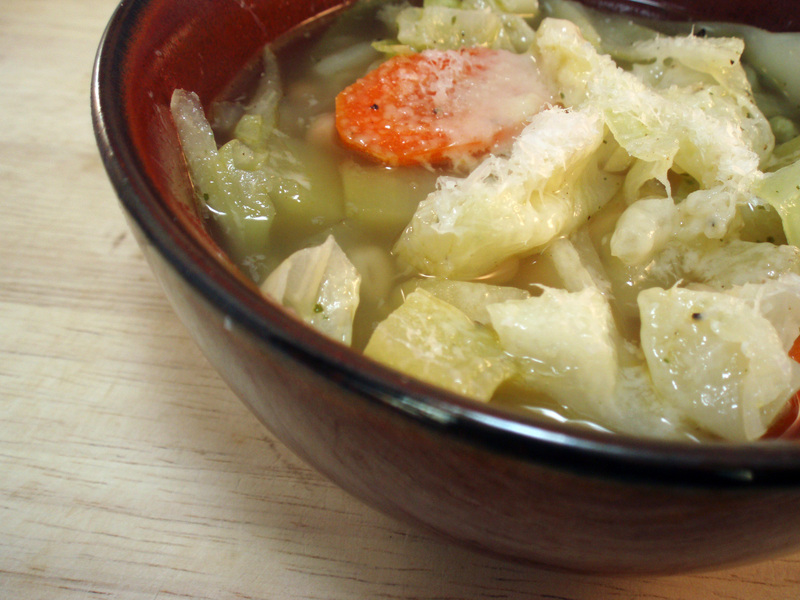 Bring the stock to a simmer and stir in the cabbage. Cook for 4-5 minutes or until cabbage starts to become soft. Taste and add seasoning as needed. (This will vary depending on what kind of stock you used.) Serve with a good amount of Parmesan sprinkled on top. This month’s Daring Cooks challenge was chosen by Cuppy of Cuppylicious. As a huge fan of Thai-inspired flavors, I was excited about this challenge. 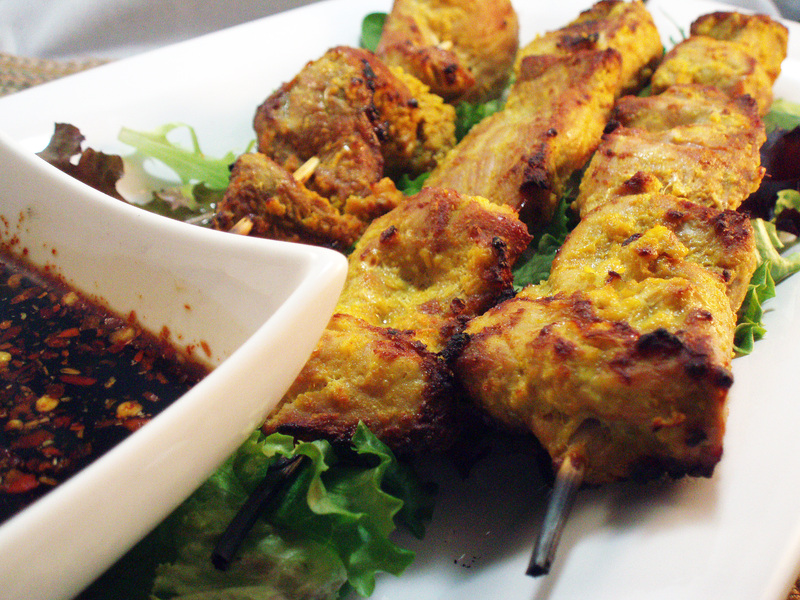 I’ve made satay before (using chicken thighs), but it was years ago. When this challenge was announced, I wondered to myself why it had been so long since satay made it on the menu. After all, marinated meat on a stick? Who can say no to that? (okay, well maybe vegetarians would, but Cuppy was generous enough to suggest tofu or veggie satay as an alternative.) Needless to say, we let our carnivorous nature take over on this occasion. I opted to use a pork tenderloin for this dish. I don’t use pork nearly often enough. It’s relatively inexpensive, and the tenderloins are, well, tender, making for a quick weeknight meal option. In fact, I did just that – prepared the pork marinade one weeknight, and we enjoyed pork satay the following weeknight for dinner. It comes together fairly quickly. I did “cheat” and use the broiler instead of the grill. My excuse? It was about 20 degrees outside that evening and quite windy. For a Texan, that’s way too cold to stand out in front of the grill! The broiler did a mighty fine job, though, and we didn’t miss the grill one bit. The verdict? Tasty enough for a party! Again, meat on a stick always goes over well, but it certainly doesn’t hurt to have a flavorful marinade and delightful dipping sauces! If I were to make this again, I might put slightly less cumin in my marinade (my ground cumin is pretty potent), but otherwise, it was wonderful! A big thanks to Cuppy for sharing this recipe – it’s definitely going to become a repeat in our household! Combine first nine ingredients in food processor, and pulse until well-chopped and combined. Place marinade and pork tenderloin pieces in a large ziploc bag, tossing pork to ensure each piece is coated. Place in refrigerator and marinate overnight. Soak wooden skewers for 30 minutes in water before using. Preheat grill or broiler. Place pork on skewers. Broil or grill until meat just begins to char, about 6-8 minutes. Flip and grill or broil other side until cooked through, another 6 minutes or so. Serve with dipping sauces. Mix dry ingredients in a small bowl. Add soy sauce and lemon, mix well. Place a small saucepan over low heat. Add coconut milk, peanut butter, and soy sauce mixture. Mix well, and warm for 3-5 minutes, stirring often. Serve warm with pork. Mix well. Serve chilled or at room temperature with pork. Don’t forget! If you haven’t entered yet for a chance to win some Xagave nectar and the Where Delicious Meets Nutritious cookbook, there’s still time! Check out the giveaway here!